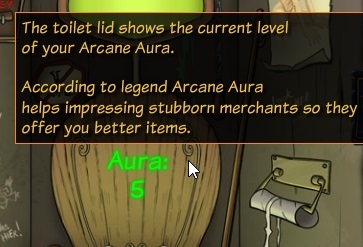 What is the arcane toilet? 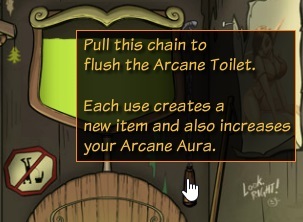 The arcane toilet is content that is unlocked at level 100. 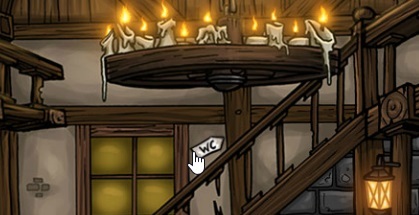 Once you find the key, you can access it by clicking the WC symbol in the tavern. Drag an item from your inventory to the bowl and the item is changed. Note, you can throw in a gem as your first item and you get nothing back, but if you add some equipment you get a new item. The item could change its class requirement, so if you drop in a warrior’s melee weapon you could get a bow. The stats may also change. The number of sockets will not change, so don’t expect to get a socket when your item didn’t have one! The first time you do this every day, you will gain 25 points for a normal item, 30 for any gem, or 50 if you throw in an epic item. If you have a spare epic item to sacrifice, make sure you do that first, otherwise I’d recommend throwing in a gem. 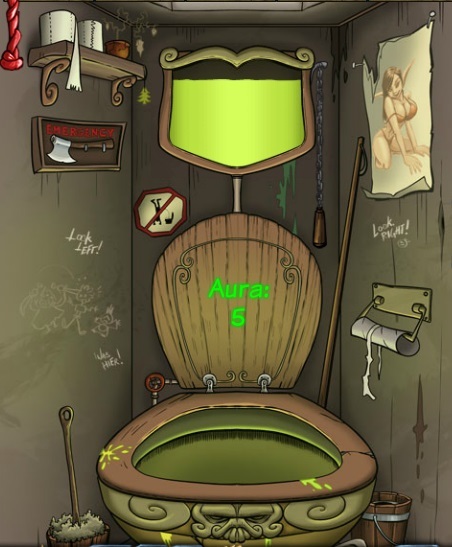 Once an item has gone through the toilet, it is worth 0 gold when you sell it. If the witch wants that type of item, it will still count towards the enchantment progress, so definitely give them to her. 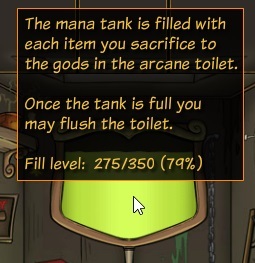 When you put enough items into the toilet, you can flush it. This gives you a new item, but more importantly it improves the quality of items offered to you in the shops. Once you reach level 150, you will get access to The Tower. I’ll make a post about this another day. Essentially the tower gives you three companions, so you can actually use items designed for all classes. These stupid wrong-class items are not so stupid after all! 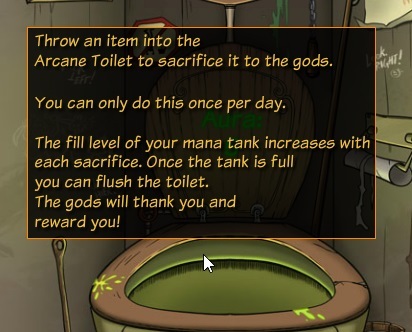 The text clearly says you thrown an item into the toilet once a day. It lies! You can in fact do this multiple times per day, but you only get points for the first item you throw in. The first time you throw an item into the bowl every day, the fill level increases. The increase is normally by 25, but is by 50 if you throw in an epic item. When the fill level reaches maximum, pull the chain. The fill level drops to 0, the arcane aura level increases, and you get a new item. This shows the aura level. The more the merrier, as you get better items when the aura level is higher. Note, comments have been disabled on this page due to spam.